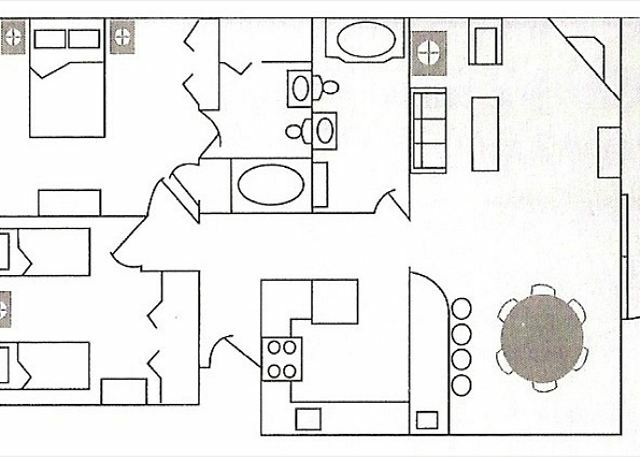 This first floor two bedroom condo in building 4. The living room offers a 42in flat screen TV, a queen sleeper and a wood burning fireplace. New furniture consisting of coffee and end tables and dinette set and bar stools have been added to the living and dining rooms. 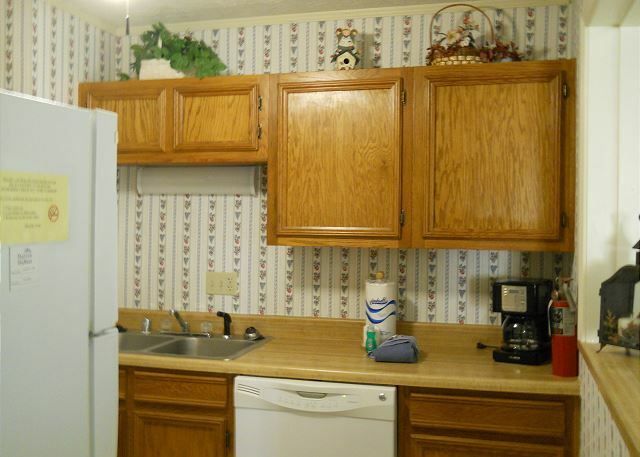 The kitchen is fully equipped with a microwave, ceiling fan and many accessories. 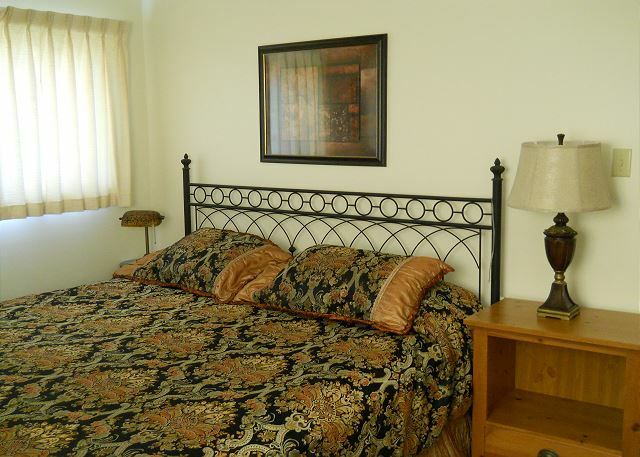 In the Master BR there is a King size bed, ceiling fan & 32 inch flat screen TV. The guest BR has a Queen bed, flat screen 24 inch TV and ceiling fan. The unit also offers free WiFi. You will experience a beautiful view of mountains and skiers on Oma's Meadow Ski slope directly from your private balcony. The property also has tennis courts and outdoor grilling areas. 93 % of our reviewers would recommend this vacation rental. This unit was clean and comfortable for us. Two bedrooms and a hide-a-bed couch so all three of us could sleep separately. The only drawback for us was that the Oma's Lift was not running, so we had to drive down to the lodge. Oh well. Might be better to reserve a weekend in later Jan / early Feb so that you'll have a better chance of the lift running. We rented Jan 6-8. Had a great time with my 4 and 2 year old grandchildren skiing for the first time. The condo location made it easy to get to the mountain. Our overall experience was great. The kids had a fun time snowboarding! Room was good but needed some minor maintenance and some of the kitchen utensils and cookware needs to be replaced. Very nice 3 day vacation. Great location, truly a ski in/out. Staff extremely nice, condo very comfortable and everything was like they said it would be. Will be back for sure!! Ron B from Buford, GA does not recommend this vacation rental. It was nice to be at the top of Umas meadow, but all of us were curious, by the end of the stay, what the renovated units would have been like. Beds were old, stove was older and the eyes were slanted. We all had a great time and will be coming back to ski, but will be getting a renovated unit, mostly because of the beds. Place was clean and had everything you needed to cook and recover from hiking. Could use some updates (visually) but everything was well maintained. We have never seen anyone at the office which surprised me since i would expect at checkout to see someone. The condo was in the perfect location and made skiing very convenient. We were very surprised at the local area having some really good restaurants, being a small town. Overall a great place to stay and vacation. This unit was awesome, from the location to the amenities. Everything worked well and we would recommend this to anyone! Close to indoor pool and slopes. You can't get any closer. Great skiing and accommodations. Decided to stay an extra day and staff was great, Had to switch to another unit, next time will book for 3 days. There were 4 of us and we had plenty of room in 416. The view was beautiful. Our access to the slopes were very nice even with the lack of snow. The pool was only a minute from us also. We had a GREAT time. Only thing I would change is that firewood be provided at no charge. If you enjoy skiing this is a great little place to stay. Less than 10 minutes to the lodge. Wonderful access to the slopes. Wish we could have stayed longer on check out day so that we didn't have to change at the car after skiing all day. overall an enjoyable experience. because of "electric baseboards" the room took a long while to warm up. but other then that, it was clean and comfortable. the location was excellent.